I received this book for free from Gemma Halliday Publishing in exchange for an honest review. This does not affect my opinion of the book or the content of my review. Organization expert Kate McKenzie is on track to make her new business, STACKED IN YOUR FAVOR, a hit in small-town Vermont. But when her first client, the wealthy Amelia Nethercutt, is found dead, the job takes a decidedly sinister turn. Kate thought she and her family were making a fresh start in her husband's hometown, but she quickly learns that small towns can hold big secrets. When her first client is poisoned just after Kate leaves her mansion, she knows she's gotten off to a bad start. But things only get worse when the police find Kate's fingerprints on the murder weapon, suddenly putting her in the position of suspect number one. The stopwatch is ticking for Kate to prove she had nothing to do with the murder, and the odds are further stacked against her when items stolen from the Nethercutt mansion start showing up in the McKenzie home. Now, Kate must trust her methodical skills and expert eye to sort out who is trying to frame her and to find the real killer before she's organized right into a jail cell. 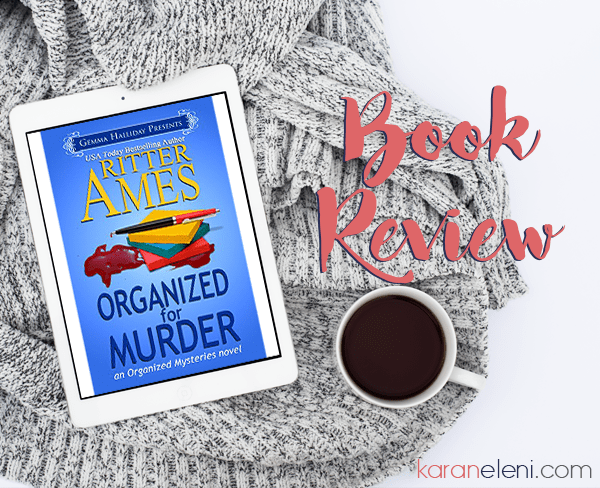 Organized for Murder is the first novel I have read by Ritter Ames. Admittedly, it took a few days to get into this story. The ONLY reason I can think of is because I was trying to read the PDF on my Kindle Paperwhite. I loaded the PDF onto my iPad, started from page 1 and was immediately sucked in. Lesson learned. I wasn’t able to put it down and when I saw 2:00am on the clock, I had to force myself to put the iPad out of reach and continue after work the next night. Kate McKenzie proved that being organized could help in ANY situation, including tracking down a murderer. I strive to be organized in most areas of my life, but there is always a new idea and I learned several which will be implemented very soon. Thank you Kate and Ritter for the wonderful tips and amazing story with a great twist ending! This girl will be waiting (im)patiently for the next in the series. Ritter Ames is the USA Today Bestselling author of the Organized Mysteries series and the Bodies of Art Mysteries series. When she’s not writing or brainstorming new mysteries, Ritter is usually trying to get her favorite yellow lab to stay out of the pond, or keep her grouchy black cat from trying to give the dog away on Freecycle. Ritter would love to live on a boat and write from far flung locations around the globe, but the dog would constantly have to be fished from the water, and her husband and cat would just complain endlessly about the dog’s smell, so staying on land seems to be the only good option to keep her sanity and not get sidetracked from writing.